Each year the Royal Prince Alfred Yacht Club (RPAYC) holds their annual “Lighting of the Fire” event, a tradition to kick start Friday evening club drinks over the winter season. 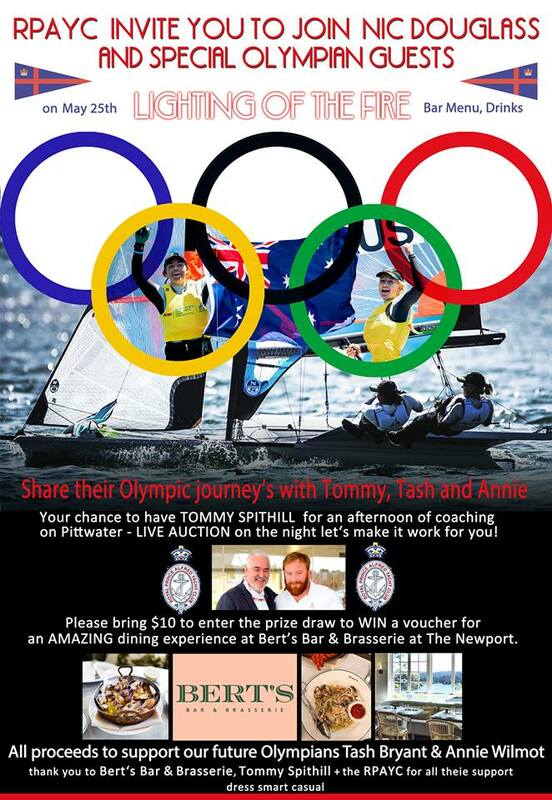 Last night, 25 May the event was held in conjunction with a fundraiser for the Olympic campaign of Australia’s current “Female Sailors of the Year”, Tash Bryant and Annie Wilmot. The fire was lit in more than one way, so to speak, with an in-depth panel discussion on Olympic pathways and successes with Lisa Darmanin, silver medallist in 2016 on the Nacra 17 (currently campaigning for 2020 with helm Jason Waterhouse), Tom Spithill and Traks Gordon, top sailing coaches, and Tash Bryant and Annie Wilmot who are currently campaigning in the 49erFX. The panel, hosted by Nic Douglass, Sailor Girl, not only spoke about the upcoming 2020 Olympics, but the efforts needed now to develop sailors for the 2024, 2028 Games and beyond in an environment such as the RPAYC that is rich with Olympic history. Tom Spithill was then auctioned off by Nic Douglass in order to raise funds for Tash Bryant and Annie Wilmot, and a raffle drawn as the girls lit the real fire in the Club to signify the start of winter. You can watch a replay of the discussion and the auction via the video below. 35 RPAYC members have represented the club in Olympic teams, winning ten gold medals, three silver and one bronze. Sir William Northam won an Olympic gold medal at the 1964 Tokyo Olympics in the 5.5 metre class with crew Peter O’Donnell. He was aged 64 and is the oldest yachting gold medallist, as well as being one of the first inductees into the Australian Sailing Hall of Fame. Martin Visser competed in the International Star Class at the 1964 Tokyo Olympics. In 1980 three RPAYC members, Richard Coxon, Garry Geitz and Pod O’Donnell, were selected in the Olympic Team. However, due the boycott did not compete. In 1972, David Forbes and John Anderson (who was present for the 2018 Lighting of the Fire) won a gold medal at the Kiel Olympics in the Star class. In 2011 Alyse Saxby won Gold in the 420 class, Special Olympics and also Silver in the same class in 2007. In 2012 Dan Fitzgibbon and Leisl Tesch won gold in the Skud 18 class, which they repeated in 2016. In 2012 Nina Curtis won Silver in the Women’s Match racing (currently on board with Team Brunel). In 2016, Jason Waterhouse and Lisa Darmanian (one of the evening’s panellists), won silver. Colin Beashel has represented Australia at the Olympics six times in the Star class winning bronze in 1996. Colin was also the Australian Flag bearer at the opening ceremony in 2004. For more adventures head straight to Nic’s social channels, @sailorgirlHQ on Facebook, Twitter or Instagram.